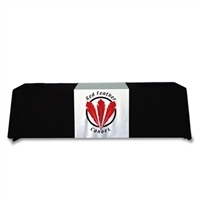 Our custom table runners make any trade show or exhibit table into a branded display. Choose from a variety of sizes. Table Runner Custom Print Dye sublimation 24" x 66"
Table Runner Custom Print Dye sublimation 30" x 66"
Table Runner Custom Print Dye sublimation 24" x 86"
Table Runner Custom Print Dye sublimation 36" x 66" . Table Runner Custom Print Dye sublimation, 30" x 86" . Table Runner Custom Print Dye sublimation, 36" x 86" . Table Runner Custom Print Dye sublimation 48" x 66" . Table Runner Custom Print Dye sublimation 60" x 66"
Table Runner Custom Print Dye sublimation 48" x 86"
Table Runner Custom Print Dye sublimation 60" x 86"